Read below for more info. Free for all registered customers, old and new. The kits come with 4 sets of cymbals sampled from a Zildjian set (sticks and hotrods) and a Turkish set (sticks and brushes) and additional Cymbals (Sabian and Ufip) and 6 snares from Ludwig, Sonor and Tama, presented in 13 different versions. These kits have been largely used since the '90s to craft some of the best selling music ever recorded. Featuring Modern Retro Drums, BBassV and Model 7 Grand piano + a handful of guitar tracks. This is a selection of audio demos for Modern Retro Drums. For more info on the demos, please hit our Soundcloud page. Some demos are also presented in a Drums++++ version with the rest of the arrangement mixed very low so you can better enjoy the sound of the library. All demos feature the drums purposely mixed inside the hosting plugin, hence using only the stock effects available in Kontakt. The only processes applied to the drum sound after it exits the hosting instrument are: a brickwall limiter on the master (Fabfilter Pro-L) and the mp3 encoding. Some of these audio demos are tracked from the BFD version of Modern Retro (marketed by Fxpansion), but the two share the same exact sample set, hence they testify the kind of sounds one can achieve. After a through analysis of the best selling singles from the 90s we realized, contrary to our belief, that drums featured a rather large real room sound, even if sometimes very low in the mix. So we opted for an historical room in Italy that is not operating anymore as a recording studio. When we were granted access to this space, we had just a few days to setup and capture the drums. Another recognizable sign in music of the '90s is the importance in the mix given to the kick: if the '80s saw loud snares, the '90s where all about kick sounds, mixed rather up front and with a lot of work on both the "click" and bottom of the kick sound. For this reason, we opted for an extensive use of microphones on the kicks and we prepared the two kicks we had at disposal in no less than 13 different ways. The 6 snares offer a range that goes from piccolo snare to lowly detuned and muted either using a cloth or various damping materials, resulting in 13 very usable sounds. Even if slightly different in regard to recording technique, the single drums from each kit can be easily mixed since they share the same room, mics and positioning in the room. 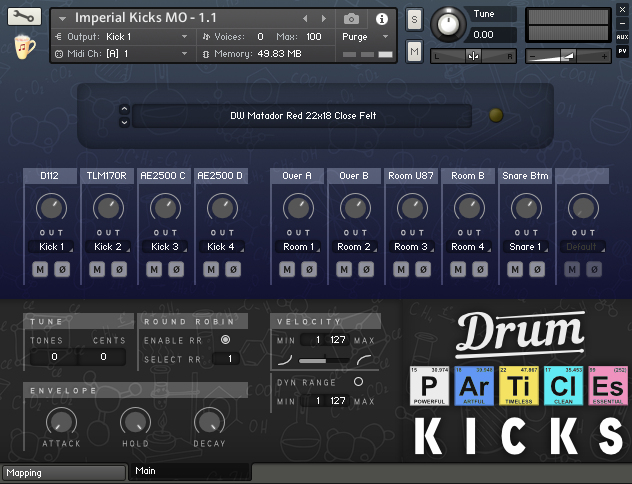 When we decided to support Kontakt we knew we needed to offer a custom interface for drums. Development took a bit under two years and now we are proudly shipping the first version. The user interface is thought out to be easy and quick to learn and use while featuring the power-user tools some of us love to tweak when working with drums. We developed a custom Style Player for the Kontakt version. In depth info is available in the walkthrough video above or read through for some more info. Play from the Kontakt interface: switch in realtime (and in Sync to the host, if desired) between multiple intros, main grooves, fills and outros. All of this turns the 1119 available Patterns, organized in 19 Styles and recorded using a real drummer especially for the release using the same samples, into billions of possibilities at your fingertip. With 19 Styles and 1119 patterns, our focus for Modern Retro was in delivering a collection of bread & butter grooves and fills fit to the drum sounds: don't be fooled though, when we use the term "bread & butter" we refer to the highest quality french bread and danish butter one can buy in terms of quality and usability, so much that we crafted all of our product demos with those Styles. The Styles are freely inspired by some of the most successful singles from the 90s and, again, we were amazed at how much creativity and variety we ended up discovering in those hit songs, to which we added our production style and the musical taste of a first-call session drummer. The IR Reverb module in our engine currently features 36 unique proprietary impulse responses. These are originated from vintage plates, hardware and coveted real rooms, which, when used with drums, push the limits of what can be done with a single drum kit. 25 global mix-ready factory presets ease your way into using these drum kits, to which we add presets for each channel, including the reverb path. Each channel inside our Kontakt engine can be routed to a separate output, when properly configured in Kontakt, leaving you with the freedom to mix the drums using your own plugins or external outboards. Each articulation features no less than 16 velocity levels, all the way up to 32. Now includes Drum Particles - Modern Retro Edition - FREE! We released the first multi-mic drum library in 2003, with Scarbee. We know drums. We know drum-sampling. We know how to turn a drum recording session into a set of coherent, greatly playable sampled instruments. Not just a collection of sounds. This effort needs a lot of love for drums, time, ear, knowledge, dedication and experience. Our drum samples have been used on countless tracks in the last 13 years, counting on an ongoing success still sprawling from our first library, Imperial Drums, re-released in BFD format through FXpansion at the end of 2013, our ever-growing product line and the large large number of companies we worked with along the years: Native Instruments, Ableton, Steinberg, Arobas, Cakewalk and Presonus to name just a few.